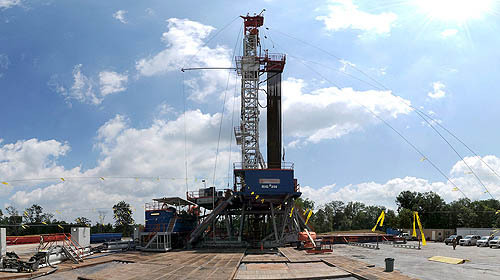 Falling natural gas prices have stalled Pennsylvania's shale boom, sending drilling rigs across the border into Ohio. Most of the Keystone State's shale is heavy in "dry" gas, pure methane that's ready for the pipeline as soon as it is extracted. But after two years of heavy drilling in northeastern Pennsylvania, a glut in supply has sent gas companies scrambling to southwest Pennsylania and Ohio in search of "wet" gas, which comes with a mix of other petroleum byproducts like ethane and butane. These byproducts, while costly to filter out, fetch a good price on the market and have made extracting wet gas more profitable. In this map of "spuds," or recently-drilled wells, you can see the march westward month-by-month as natural gas prices drop. Click through the timeline below to cycle through the past two years. Each circle represents the number of well sites drilled that month in a municipality, with bigger circles indicating more wells. Click on a circle for details on each new well.